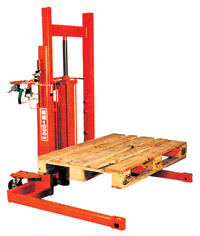 The low cost QuickWood stackers are designed to automate stacking and de-stacking. These simple devices have an adjustable height sensor which is set to the bed height and will accept any thickness panel taking up to a 1000kg load. There are two different sizes and both available in either Pneumatic or electric versions.